. : Visit ShopBeretta, BerettaUSA's official web-store :. The aut. pistol of the series 950, manufactured in cal. 6,35 (.25) and serving as base for the .22 short pistols, can be considered as the real pocket weapon for defense and sporting purposes. To its qualities of particular lightness it unites those of precision, sturdiness and security, which are the characteristics normally recognized to pistols of larger caliber, weight and dimensions. Compared with the foregoing series, the series 950 B enhances the results of large and extensive experiences which are proper of the BERETTA line. - full absence of whatever extraction device (which after longer use is subject to breakage) on account of an ingenious exploitation of the recoil force and also because of the hinged barrel. 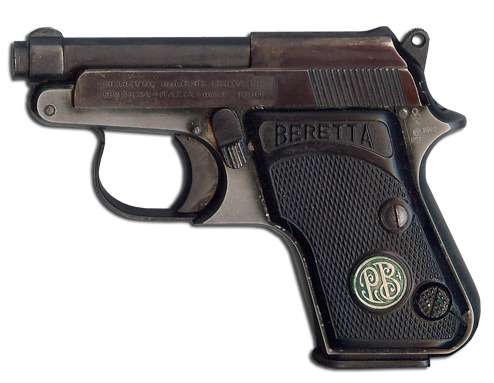 The 950 B maintains unaltered the characteristic of the outside hammer, which is proper of the BERETTA pistol in all its larger calibers, with the known advantage to consent to keep a cartridge in the firing chamber with lowered hammer, assuring the highest safety degree (it is though advisable to avail oneself of such advantage only in particular cases). The hammer consents besides to repeat the percussion in case of insufficient primer, without the necessity to recock the arm by pulling the slide backward. The hammer is provided with a safety catch, which acts on the sear lever, so as to prevent any accidental firing.The body (frame) of the 950 B is made of a special light alloy of very high resistance, so as to confer to the weapon Iightness and high sturdiness; the barrel and the slide are of alloy steel duly annealed.All other parts are manufactured with suited and selected material and are interchangeable.